From everything we’ve shared with you, you can see how important these services are for us and for all the ways they extend the experiences of our customers even further. They entertain, inspire, inform, and enrich our lives. Because at Apple, the customer is, and always will be, at the center of everything that we do. It’s a short statement, but a useful way to think about the event specifically, and the state of Apple generally. Just as disconcerting was the lack of pricing information: Apple News+ is $9.99, and the Apple Card has no fees…and that’s all we know. Of course this event was considerably different than WWDC, and so was the intended audience. Developers for the most part are out (although Apple Arcade is of interest), and while these services are certainly meant to be consumed by customers, the fact that most won’t launch for a while dulls the benefits Apple will gain from press coverage. We can’t change macroeconomic conditions, but we are undertaking and accelerating other initiatives to improve our results. That is why I thought Cook’s most telling phrase was “How Important These Services Are For Us”; if Cook wanted to signify how importantly Apple was taking its efforts in developing these services, “to us” would have been a more natural turn of phrase. And, while I grant that is probably what Cook meant, the preposition change, in my estimation, gets at the heart of the matter: the iPhone isn’t going anywhere — Apple is very much not doomed — but it is no longer growing, leaving Apple no choice but to look elsewhere. Create New Products: This is the most obvious path, and also the most difficult. Creating products that resonate is really hard. Still, that hasn’t stopped Apple from trying, and frankly, the company is doing quite well: the Apple Watch is a hit, AirPods are becoming a cultural phenomena (and the potential foundation for audio-based augmented reality), and the company is well-placed to compete in the visual-based augmented reality space. The HomePod is a bit of a dud, but to management’s credit the company appears to have already moved on. All of these successful products fit Apple’s DNA of personal computing, and are the most encouraging signals that Apple will be fine. The problem, though, is that there will never be a product like the iPhone again; Apple may have found its product future (good for developers and customers), but its financial future is less certain (not so good for Wall Street). Extend Integration: Apple is, famously, vertically integrated; the company writes the software that differentiates the iPhones that it manufactures and sells for a profit. 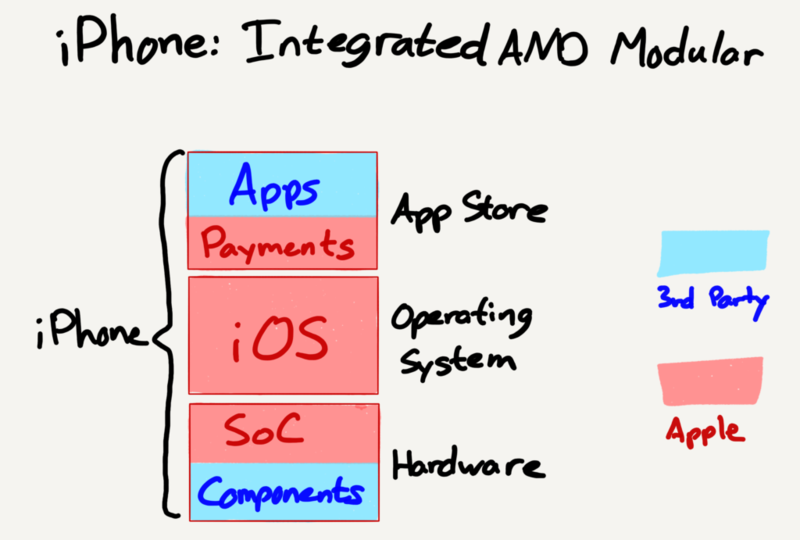 That does not mean, though, that the entire iPhone experience is integrated — there are significant amounts of modularity. For example, Apple sources nearly all iPhone components from 3rd-party suppliers (Samsung, to take a counter example, manufactures more of its own components), and of course the vast majority of apps that are used on iPhones are made by 3rd-parties as well. Apple has also integrated Services like iCloud backup, Siri, and Photo Stream; those services, though, have been more akin to Apple’s integration into processors in that said services are meant to differentiate iPhones, not be revenue drivers in their own right. Yesterday’s announcements were an important departure from that strategy in two respects. First, services like Apple Card, Apple Arcade, and Apple News+ (I will get into the details of these services later on) extend Apple’s integration forward with the goal of driving new revenue. Acquisitions: This is, by definition, the most expensive way to acquire growth. It is also often the one that makes the most sense for cash-generating behemoths like Apple — and exploring the prospects of Apple TV+ show why. The Apple TV portion of yesterday’s announcement actually had two parts: the Apple TV+ streaming service, which I will get to in a moment, and Apple TV Channels. The latter is a service akin to Amazon Channels or the Roku Channel Store; customers can subscribe to a la carte “channels” like HBO or Showtime, the content of which will be incorporated into the Apple TV app. Apple’s desire to be “the one place to access all of your television” implies the demotion of Netflix to just another content provider, right alongside its rival HBO and the far more desperate networks who lack any sort of customer relationship at all. It is directly counter to the strategy that has gotten Netflix this far — owning the customer relationship by delivering a superior customer experience — and while Apple may wish to pursue the same strategy, the company has no leverage to do so. Not only is the Apple TV just another black box that connects to your TV (that is also the most expensive), it also, conveniently for Netflix, has a (relatively) open app platform: Netflix can deliver their content on their terms on Apple’s hardware, and there isn’t much Apple can do about it. Apple is at its best when it is creating new products that are the best they can possibly be; it is a capability that is rather independent from Apple’s biggest strategic assets: its dedicated user base and massive cash pile. Instead Apple has decided to compete with Netflix, at least to an extent, using those strategic assets: the company is spending some billions of dollars to create original content that will be available on all Apple devices. Notably, though, Apple TV+ content will be available on other devices as well, including Amazon and Roku’s TV boxes and smart TVs from Samsung, LG, Sony, and Vizio. It appears that Apple is attempting to thread the finest of needles: by not having players available on Android, Windows, or the web, Apple TV+ acts as another extension of Apple’s integrated model, differentiating Apple’s hardware in the process. The problem, though, is that creating or acquiring content is a fixed cost: that means that the economically optimal approach is to make that content available as widely as possible, increasing leverage on those fixed costs. Thus the partnerships with Amazon, Roku, and smart TV manufacturers. Unfortunately for Apple, I’m not sure that this exclusion is sustainable when it comes to competing with Netflix. As demonstrated by the parade of celebrities during the second half of yesterday’s event, Hollywood is driven first-and-foremost by cash. Whoever pays more for a show gets that show, even if — as Netflix continues to demonstrate — the entity making the payment is in the process of upending the entire TV value chain. To that end, Apple certainly has the cash to compete with Netflix on a show-by-show basis (thanks to the still fabulously popular and profitable iPhone in particular); what is critical to understand, though, is that outbidding Netflix for a show basically guarantees that said show will lose money for Apple, at least for the next few years, thanks to Netflix’s huge subscriber base. Netflix’s break-even point for a show is $2,000 (200 x $10); sure, Apple could outbid Netflix and pay $2001, but that means a loss of $1501 ($2001 – (50 x $10)). Is Apple willing to stomach the years of losses necessary to increases its subscriber base to a level where it can profitably compete with Netflix for shows? And, as a short-term concern, can Apple really afford to ignore billions of Android and Windows devices? Indeed, this is precisely why I argued that Apple should simply acquire Netflix back when the company was worth <$50 billion (the price tag is quite a bit more unrealistic now);2 truly competing in the streaming video space, with its horizontal model that works orthogonally to Apple’s core vertical business model, means that the only real advantages Apple has are the default apps on the iPhone and a huge amount of cash, and those advantages could be applied to an acquired Netflix far more efficiently than they could to a brand new streaming service — like Apple TV+. That, though, takes me back to the needle Apple appears to be trying to thread: the only way that Apple TV+ makes sense strategically is not as a new product with a new business model, but rather as another extension of Apple’s integration, i.e. a way to not simply sell new iPhones but also Apple’s TV app generally, including the commissions Apple will collect from Apple TV channels. In short, Apple may increasingly be a services company in terms of the recurring revenue it earns, but its strategy is still very much rooted in a product world where differentiation comes from vertical integration. Apple Card: This makes a ton of sense: Apple is uniquely placed to differentiate a credit card thanks to Apple Wallet and Apple Pay (a numberless card is particularly neat, and only possible because of the Apple Wallet integration); the rewards and interest rates are very average (in-line with the Amazon Rewards Visa but inferior to the Amazon Prime Rewards Visa) but, in true Apple fashion, the card is much cooler looking. Also, don’t be surprised that Apple is partnering with Goldman Sachs: the company (rightly) wants nothing to do with the regulations entailed by being a bank, even if it means sharing those lucrative transaction fees. Apple Arcade: This will hurt the up-front purchase game market, at least what little is left of it. The most reliable way to make money in the App Store is with either a free-to-play model (where you have to buy in-app purchases to progress) or a free-to-win model (where in-app purchases are largely aesthetic, a la Fortnite). Games that support neither are left trying to adapt Apple’s in-app purchase mechanism to support trials (i.e. download the game for free, make two levels free, and make an in-app purchase to unlock the rest) and praying their game will be featured in the App Store so that they can recoup their costs. Apple Arcade is a very different model: first, Apple is paying up-front for exclusivity — already a more sustainable model for game developers — and second, subscribers (i.e. people who are generally willing to try and buy new games regularly) will surely look to try other Apple Arcade games before they bother downloading new ones, making things tough for anyone not a part of the bundle. Again, though, it is not as if the current situation is great for traditional games that you pay once for anyways; there is a decent chance this is a more sustainable model for everyone (and, of course, a nice revenue stream for Apple). The vast majority of media is completely commoditized and, in a world of zero marginal costs, happy to accept whatever pennies Apple is willing to throw their way. What is more noteworthy are the publications that aren’t there, particularly newspapers that have managed to develop direct connections with customers based on subscriptions (and one that is — the Wall Street Journal — is severely limited in discoverability and availability). This is exactly the right decision for them, as I explained last month in The Cost of Apple News. That leaves Cook’s final line: At Apple, the customer is, and always will be, at the center of everything that we do. I want to put a ding in the universe. Your time is limited, so don’t waste it living someone else’s life. Don’t be trapped by dogma — which is living with the results of other people’s thinking. Yesterday didn’t have many dings, and fair bit of other people’s business models. Only time will tell if the diversion from what the company does best leaves Apple trapped.